A second visit on March 2010’s ‘Nottingham Big Day Out’ after a fascinating trip to Dukes wood oilfields was to the nearby village of Calverton and it’s tiny, quaint Folk Museum on the Main Street near the shopping precinct. The museum had been elusive to me in the past and I learned that it only opens on one Sunday every month. It’s well worth seeking out though. The museum sits next to the Baptist Church and it’s tiny interior is crammed with interesting Victoriana. It’s a typical example of an old stocking worker’s cottage – from the home-based workers that spawned the phrase ‘cottage industry’. It has two rooms up and two down. It was explained to visitors that a doctor from the nearby village of Epperstone used one of the lower rooms as his surgery. This room now houses a nice example of a frame worker’s knitting machine. Calverton is of course the home of one William Lee in the 16th Century. Lee invented the knitting machine it is said due to a woman he was courting at the time being more interested in knitting than in him! 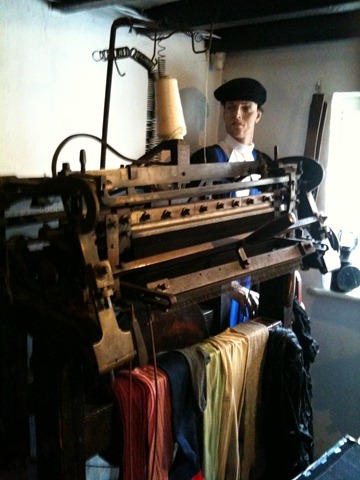 Travelling further in the early 1800s’ a violent reaction occurred against the stocking frame machines when Ned Ludd of (some say) Leicestershire was said to have sabotaged two of the machines as a protest against the loss of labour caused by William Lee’s invention. ‘The Luddites’ and their movement wrought bloody riot and disarray around the villages of Nottinghamshire and further beyond into Yorkshire, Lancashire and further. Still to this day we talk of a ‘Luddite’ as one who shuns or ignores technological advances. It was explained by the friendly guide how difficult life would have been in the days of stocking frame workers. The children of the house would begin work at just nine years of age and every member of the family would do their share. It was a hard life, living in tiny, cramped and overcrowded conditions. Bare brick floors to walk upon and damp walls were normal. At this cottage the water had been drawn typically from a well in the back garden. Illumination of the home was a curious affair. The light was provided in the form of a paraffin lamp or even just a candle, placed behind a globe made of glass filled with spring water and Aqua Fortis for magnification. An example of this sits in a lower window. 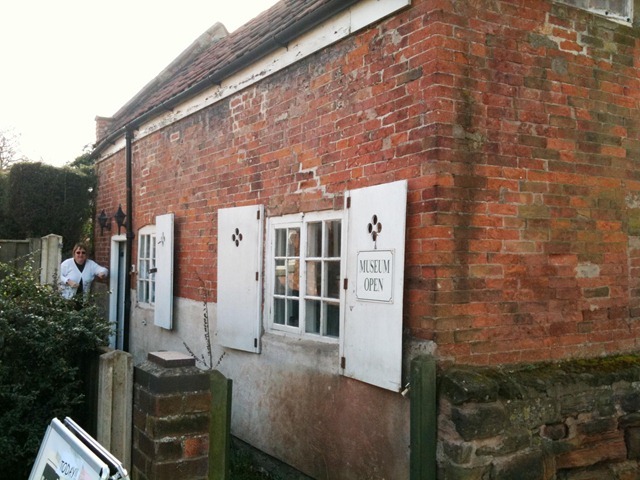 The museum is a nice resource for Calverton people as it has information about many of the local families. There’s something for everyone though and I particularly enjoyed leafing through some very random old scrap books upstairs that had been donated. 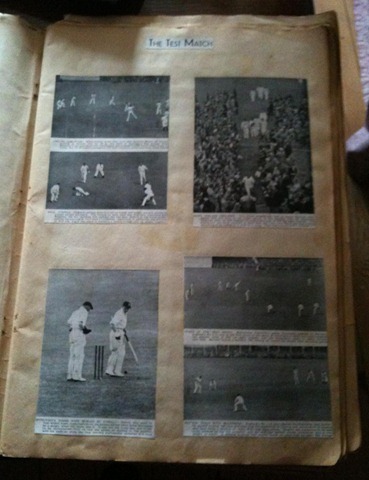 Sepia images of a smiling thirties Don Bradman leapt out of the delicate pages. 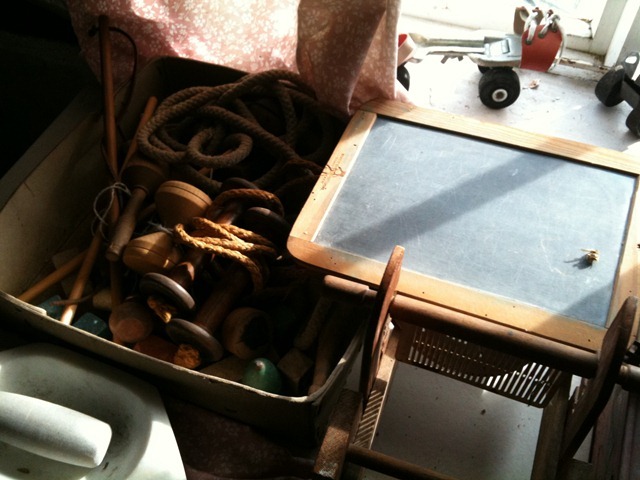 Scattered around were many artefacts and perhaps some of the most interesting to me were those that had survived from Victorian times into the 1960s’ of my childhood such as ‘whips and tops’ and the old strap-on roller skates. It was an extremely warm welcome we received at the Calverton Folk Museum. One of the guides and two other visitors I discovered had all attended Redhill School a few summers ago and we had a nice chat talking about old times and some of those teachers at the suburban school. It’s not easy to catch this slice of local history with it’s doors open but I’d urge anyone with an interest to spend an hour or two there on one of the Sundays each month that it opens. It’s a lovely visit. Thank Gerald. I hope you manage to make a visit to your old home. I’m very fond of the area and have relatives in the next-door village of Woodborough.